I have the idea that I knew that Penny was working on turning his website into a book, but I am not sure. When in Scotland in September 2018 I ran into the little book. What I wrote about the website also goes for the book. It is still the only attempt that I know to explain the symbols and the author does that by grouping the symbols. Penny helps even those who do not agree with his hypothesis. I must say that after these years, I still find the hypothesis daring and interesting, but little convincing. The book does add something to the hypothesis that I do not remember from the website though. The idea is that the Romans brought Mithraism into what nowadays is Scotland. Before the partial withdrawal the Romans settled much further North than what would later be the Hadrian’s and Antonine walls. Penny suggests that there, in Aberdeenshire, Romans who were “pensioned off” with a piece a land, stayed and turned their Mithraic beliefs into “Pictisch Mithraism” which spread from there. The stones would have functioned as some sort of open air Mithraea (in their original positions) and the symbols refer to Mithraic concepts, explaining them, rather than having to copy Mithraism itself entirely. So the Z-rod refers to the torch-bearers Cautes and Cautopates connected by Mithras. The “comb” are the seven-stage rungs of Mithraism. The notches in the notched rectangles are the places where the statues of Cautes and Cautopates could be found within the Mithraeum. The “mirror” is a symbol of Mithras’ birth from a rock and/or him holding the zodiac. The “Pictish beast” is the constellation Capricorn. In this way the author found explanations for many of the Pictish symbols and even explains the varieties within groups of symbols. I like the idea that the Pictish stones refer to some sort of religion or cult and are not simple (grave)markers mentioning names. Who knows if that cult would have found inspiration from somewhere else. Penny incorporates Ulansey‘s astrological take on Mithraism into his Pictish cult which seems feasible. Like I said, I do not find the hypothesis wholly convincing. 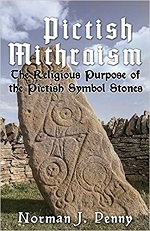 There are symbols that do not fit which the author turns to pre Pictish Mithraism (Celtic) or post Pictish Mithraism (Celtic Christianity) symbols. This makes a somewhat odd timeline. Also I wonder why Romans or Picts would set up stones which are more study-objects which can teach about Mithraism, instead of ‘just’ bring Mithraism to the North? When Roman Mithraea were located in rocks and underground locations and there is no problem finding such locations in Scotland, why make a symbolic and open-air version of Mithraism? The book sure is original and Penny performed a lot of work that other authors can build on, but I am not wholly convinced about the basic hypothesis.